BG-1.jpgMail Call"This letter says 'Don't Come Home'....nope! Just kidding!" 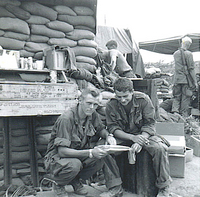 "Mail Call" in the field was the greatest morale factor in all of Vietnam. 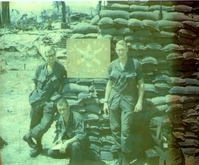 Charlie_Co,_1_35th.jpgFO's TeamKneeling, Front: Lt Bert Landau; Lt Tony Bloemhard (KIA) by friendly fire returning from a recon mission. Back Row: Co 1SG Antonio Cartagena, "C" Co commander, Capt Dave Collins, and Lt Joel Matusek, KIA. The story of Lt Matusek is provided under Bert's "Tour of Duty" link. Bert-FO.jpgOutside the bunker at Hoi AnLots of sandbags keep you safe. 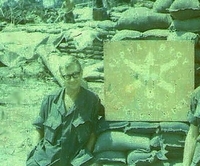 The "Steve Allen" optical frames were standard military issue back then. But...the helmets weren't! Suckers wouldn't stay on my head. 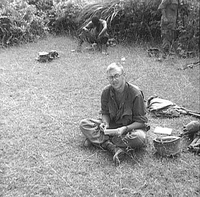 Mountains_near_Hoi_An.jpgOutside the FDC CONEXSame photo, but includes UNK SSG and Lt Wayne D. George, the FDO, with Bert Landau at far left. Bert has a natural tendency to lean on something! Okerstrom-Malnar.jpgMap StrategyIncoming RTO, PFC Laurel "Lee" Okerstrom, and outgoing RTO PFC Greg Malnar, do a little map recon. Got to know the lay of the land! BertBeach.JPGOn The BeachMy failing memory suggests that this was before we went into the mountains [and carnage] west of Tam Ky, so we were still relatively 'unbloodied' except for a few scrapes. Maybe October, 67? For a day or two, I think we were kind of pinned in with the sea at our back, on a white sand beach that was very easily defended. Choppers brought is food and mail and flew in from the sea instead of over land for the 2-3 days were were there. Even night was fairly safe since we had nearly a full moon, clear skies and anything that moved was pretty easily spotted in the white sand. Does any of that sound familiar? Bert-Gun1.jpgSapper attack @ LZ IncomingA fine example of a weak maintenance program...not! Bert-Gun2.jpgSapper attack @ LZ IncomingOne less cannon on the books. Bert-Boy.jpgThe Innocents of warThe little boy is standing on artificial legs...and smiling. OpnCtr2.jpgThe Operations CenterDesks? Tables? Chairs? What is all this stuff? 001.jpgModern-day BertStrolling around Paris...many years later. 002.jpgModern-day Bert"Just get me the coordinates and I'll take out this bridge, too". You never stop being an FO.